Have you always felt that your car’s original heater was a bit inadequate? Why not install a South Wind gas heater and drive in comfort? 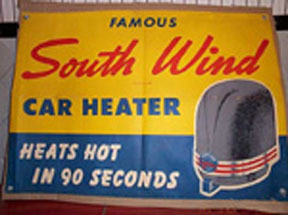 South Wind gas heaters are easy to install and have an attractive Art-Deco lookthat fit perfectly with old cars. 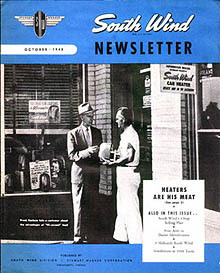 South Wind heaters were originally created by the Stewart-Warner company for American cars from the thirties to the fifties, when factory heaters didn’t exist or didn’t work very well when they did. Over three million were sold. They can be installed by any competent mechanic in any front-engine six volt car (and will work with twelve volts if you use a converter). They work by burning gasoline vapour under a vacuum so leakage or fumes do not occur. They are totally reliable and look and work great! (I have one in my 1954 Citroen and it works well in our Canadian cold weather). Most South Wind heaters that you see at flea markets are beat up and missing the parts needed to make it work. The heaters that I sell are rebuilt using N.O.S. parts and are refinished using colours as close to original as possible. Each unit is tested and comes with the parts supplied by the factory that are needed to install in your car. Each heater comes with an installation template, an original instruction manual and the gasoline pickup tube that goes into the carburetor. Because all cars are different, an exhaust line isn’t supplied but can be fabricated out 5/16ths copper tubing available at any auto or hardware store or better yet, a braided stainless steel flexible line that can be made up at any hydraulic shop. For comfortable, efficient heat in your old car install a reconditioned Stewart-Warner South Wind heater! South Wind Heater parts wanted — Contact us for more details! Sorry, I do not deal with South Wind heaters for aircraft and rear-engined cars.